The Huffington Post has teamed up with French publishers Le Monde and Les Nouvelles Editions Independantes to launch Le Huffington Post, a French version of its US news site. According to an announcement by the Huffington Post the new site will "combine the local editorial resources of Le Monde" with the Post's original reporting, aggregation, commentary and network of bloggers. 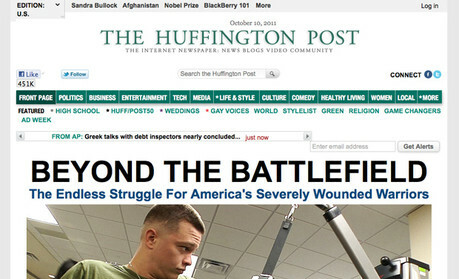 Each of the three partners will be shareholders in Le Huffington Post, which is due to launch in November. In an interview with Le Monde, president and editor-in-chief of the AOL Huffington Post Media Group, Arianna Huffington, said she has always admired Le Monde and "loved both the political and cultural coverage". "Le Huffington Post will bring together all the best of the journalism produced in any area, with our own attitude and a sense of fun and a sense of drama where appropriate and great pictures and great technology that makes it possible for others to engage, as well as honouring the best of journalism, accuracy, fact checking and fairness. "The idea will be to curate the best writing from Le Monde and from others that bring to our readers everything they need to know about politics, culture, style, fashion." She added that a team of French journalists are currently being brought together to run the new site from Paris. In the interview with Le Monde, Huffington added that she is currently in negotiations to open a site in Brazil and is also interested in Spain, Turkey and Italy. This will be the Huffington Post's first non-English language site, following the launch of Huffington Post UK earlier this year. Speaking at Journalism.co.uk's news:rewired conference in London on Thursday (6 October), editor-in-chief of the UK site Carla Buzasi revealed that the UK site had received 4.8 million visits in August.